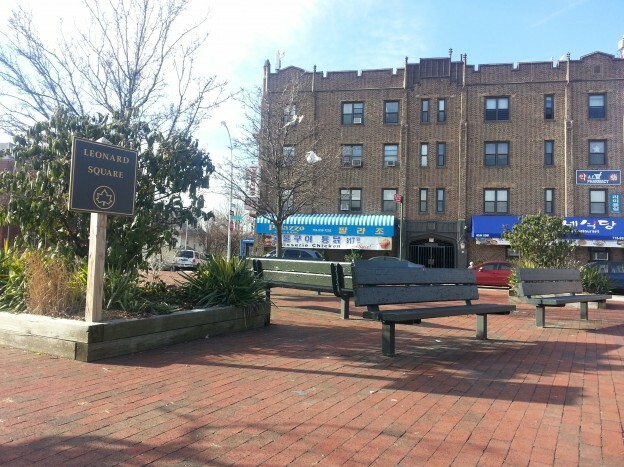 This square, located in the Queens neighborhood of Murray Hill, honors Corporal William A. Leonard (1889-1918), a Flushing native who lost his life fighting in World War I.
Leonard, a member of the 107th Infantry Regiment, 27th Infantry Division in the First World War (1914-1918), was killed in action on July 16, 1918, in Flanders, Belgium. As a boy, Leonard ran errands at the Flushing Daily Times and worked his way up to the position of city editor. Leonard was appointed to the board of the Queens Borough Public Library by Mayor John Purroy Mitchel (1879-1918), and served two terms before resigning to enter the military. Murray Hill was once part of a large tract of farmland owned by John Bowne (1628-1695), who settled in Flushing in 1651 to escape the religious persecution he encountered in New England. Bowne opened his home to Quakers for their meetings during a period of increased oppression by Director General of New Netherland Peter Stuyvesant (1610-1672), who sought to drive from the colony anyone who did not adhere to the Dutch Reformed faith. In 1662, Stuyvesant’s administration arrested Bowne for harboring Quakers and deported him to Holland. Bowne was released in 1664 following a successful appeal. He returned to Flushing when the Dutch East India Company, which employed Stuyvesant, forbade the persecution of Quakers. The Dutch East India Company was desperate to lure settlers to New Amsterdam, and religious tolerance was seen as a way to encourage settlement of the area and to increase profits from the young colony. During the colonial era, Murray Hill was referred to as Inclenberg, after the large estate of Robert and Mary Murray, who were prominent Quakers. The Murrays were descendants of the Flushing native Charles Doughty, who, around 1785, built the nearby Kingsland Homestead, the second-oldest standing house in Queens. The Kingsland Homestead is maintained by Parks and the Historic House Trust of New York City. In 1840, Samuel and Robert B. Parsons formed Parsons & Company Nursery, on the Bowne ancestral estate. The Parsons were descendants of John Bowne and longtime area residents. In 1889, Henry C. Rath and John Dayton began developing this section of Flushing, and named it for the Murray family. The City acquired this site in 1929. In 1934, Parks and the American Legion worked together to improve and rededicate the site. Today, Leonard Square is a sitting area in a neighborhood rich with history.